Plan, Plan, Plan…Did I mention, Plan? Harsh, I know. I wish I could tell you that this was just some tough love, some kind of psychology intended to piss you off enough to prove me wrong, but it’s true people. If you do not plan you will not succeed. Paleo is hard. No, after the first week of withdrawals and the second week of cravings it is not hard to stick to. What is difficult about this lifestyle change stems from the universe’s inability to understand and therefore aid in your success. The first time around doing the challenge this was the very first and most important thing that I learned. If your meals aren’t planned out, if you don’t have a contingency plan you will struggle. Paleo is hard to stick to after a 12 hour work day, getting kids to bed, walking the dog, whatever. When you are driving home you start to think about what you can grab for dinner and a flash hits your brain, you have nothing in the fridge but a cucumber and some grape seed oil. Panic ensues. You’re starving, the grocery store is 5 miles in the other direction and it is 10 pm at night. We tend to struggle because in times like these there is no easy fix, no fast food restaurant that you can order something and after some alterations still get a good paleo meal. You must plan. Spend Sunday planning your meals and making them. If you prepare your food on Sunday then you have nothing to worry in the week when work keeps you late because “Dinner’s Already Ready!” Rejoice! No frantic nights of chomping on a cucumber, no skimping or skipping meals because there is nothing ready. Plan for success and you will find sticking to this lifestyle change is a breeze. Ok, on to a quick and easy idea. 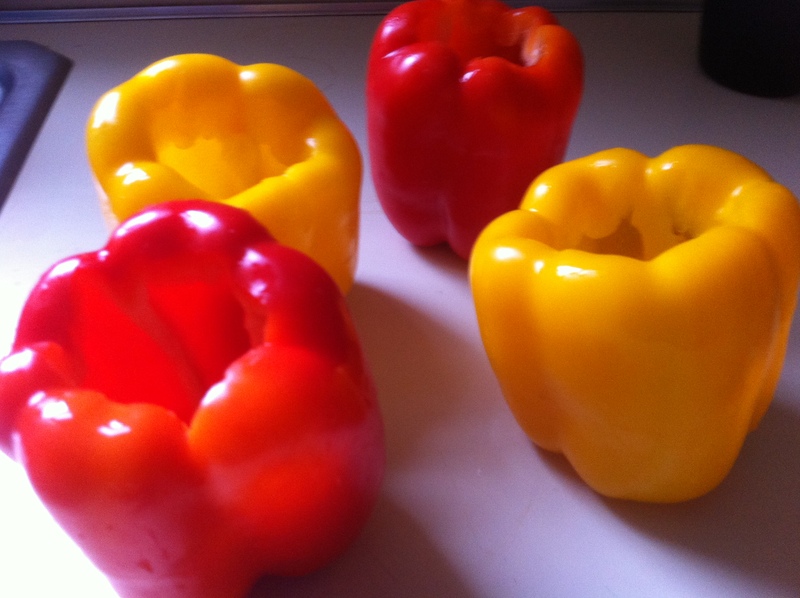 One very frequent and easy meal I like to make for us is Stuffed Peppers! Unfortunately a lot of times beautiful bell peppers (like the red, orange, and yellow ones) are really expensive and I always need at least 4 because my fiance can eat a substantial amount of food. Plus, if you want to have some leftovers for lunch the next day, it’s always good to make a few extras (plan ahead). So luckily for me when I went to the grocery store this week the good peppers were on sale! Hooray! So I stocked up and made them for dinner. *NOTE- I have cooked this two ways, one browning the meat first and the second stuffing it raw and letting it cook in the pepper. Both ways are good and acceptable but produce two different results. Try both for yourself, my fiance likes when I stuff the meat in the peppers raw and let it cook in the oven that way the turkey cooks together. If you brown it first and cut into the cooked pepper the meat is usually in crumbles making it harder to eat. But it is up to you! Let me know which way you like better! Cut a circle around the stem of the pepper and pull out the core w/ seeds. Rinse each one with water to make sure all seeds are out. Mix all spices into the meat with your hands and make sure it is good and mixed. If you want, brown the meat in a skillet and when it is finished put on a plate of paper towels and absorb the extra grease. Take meat mixture (whether cooked or not) and stuff each pepper. Place in the oven and cook for 35 minutes and enjoy! I serve these with a little salsa verde and they are delish! Enjoy!